If you're thinking about choosing Sayen Gardens in Hamilton for your engagement pictures, then you will not be disappointed. The place is truly magical. Think of an enchanted forest with flowers blooming almost year round, waterfalls, a koi pond, and so much more. Of course you can't go wrong having your engagement pictures at this location. Another great thing about it is that it is very centrally located, in Hamilton, Mercer County, NJ. 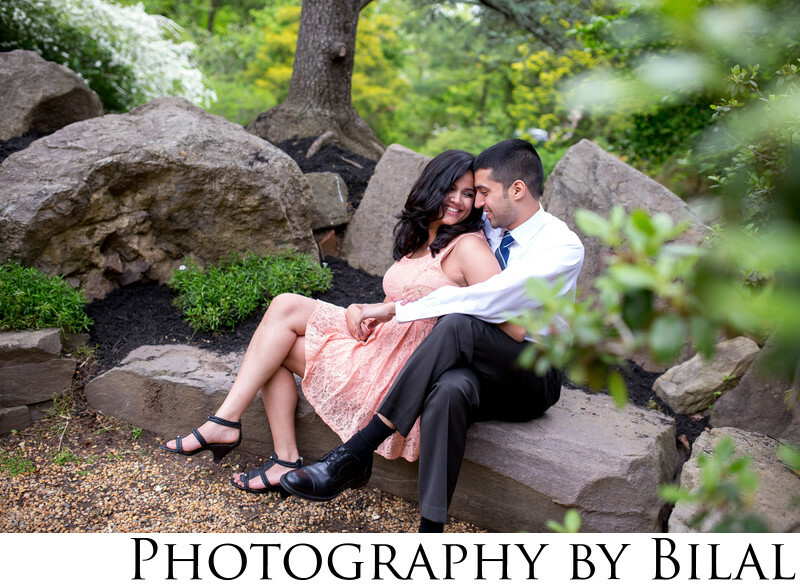 I shot this image of this beautiful couple inside the gardens. This was one of my favorite images from the engagement session because to me it just feels very natural, unposed, and you can tell there is a lot of chemistry between the couple. Part of being a good photographer is being able to bring out the natural feelings of the couple. For this image although I had given the couple instructions on how to sit, the rest was completely unscripted. We had a lot of cuddling going on which made for some great natural candid shots. I always try to invoke true emotions in my images. Does it work all the time-no-but, as a professional I know how to give my clients a few hints and pointers that will unleash those true emotions so that we can capture amazing photos that will last a lifetime. Location: 155 Hughes Dr, Hamilton Township, NJ 08690.